Many types of heavy equipment are used in mining, construction, and agriculture. Most have enclosed cabs to protect the equipment operator from excessive dust and noise exposure. When the equipment is new, controls are normally implemented into the cab to keep these exposures at acceptable levels. However, as this equipment becomes older, many components of the enclosure deteriorate, such as gaskets and seals. This causes the effectiveness of the enclosed cab to be greatly reduced. 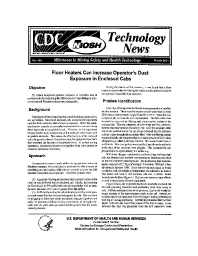 Once this occurs, the equipment operator's dust exposure can increase to hazardous levels. In surface mining operations, elevated exposures to crystalline silica have caused an excessive incidence of silicosis.